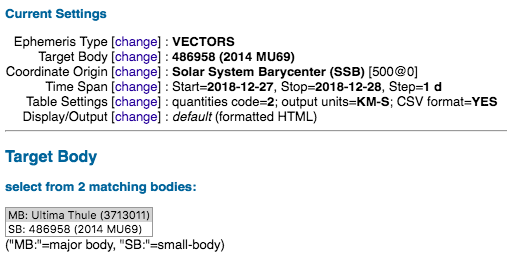 In this answer I show that the (now pretty famous) Kuiper Belt Object 2014-MU69 has two entries in JPL's ephemeris generating Horizons site; Major Body 3713011 and Small Body 486958. I'm pretty sure these represent the same body, their trajectories differ by about a half-million kilometers only, and that difference is probably only because for one of them the trajectory is only based on a 118 day arc of it's ~100,000 day orbit at ~43 AU back in 2015. Are both 3713011 and 486958 still official references to the same body, but in different catalogs or databases? Is there a disambiguation page linking the two numbers somewhere? How did 2014-MU69 (unofficially Ultima Thule) get promoted from SB to MB? 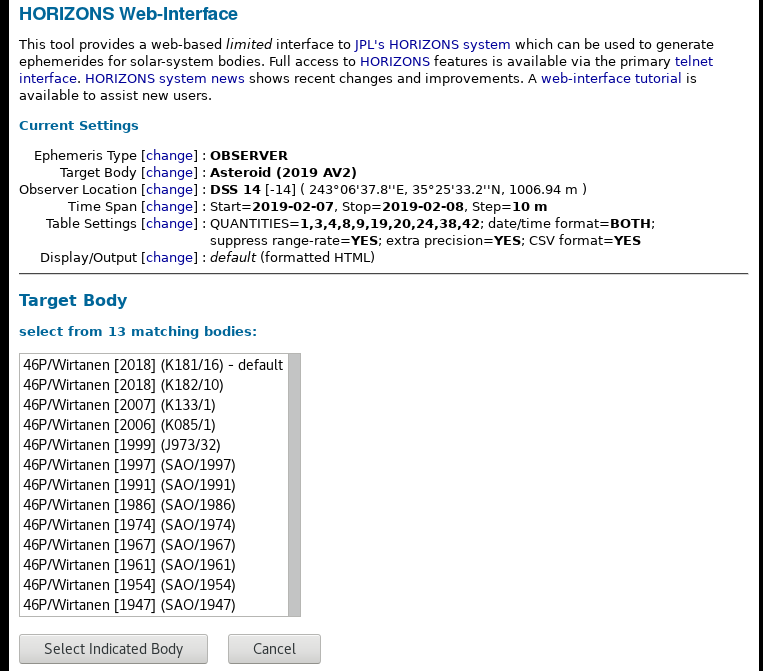 The 3713011 object (that is the internal SPICE/SPK id) is a special trajectory computed by the New Horizons team at SwRI which included data which is not in the public domain. The other one for (486958) 2014 MU69 (its official asteroid number and temporary discovery designation) is for the publicly available data. (486958) is 2014 MU69's official number and is used at e.g the MPC. 3713011 and 2486958 are the JPL SPK id's for the kernels with and without the extra trajectory information respectively; they are not used outside JPL's software such as HORIZONS, Small Body Browser or the SPICE toolkit. Tutorial 18 of the SPICE Tutorial covers SPK files if you want more details. Not the answer you're looking for? Browse other questions tagged asteroids terminology nasa kbo or ask your own question. Have we ever observed a body, such as a large asteroid, “hitting” the Sun?